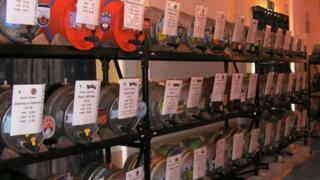 A real ale festival in the Isle of Man has proved so popular it is moving to a larger venue, organisers have said. This year's Campaign for Real Ale (Camra) festival will move from to the Villa Marina in Douglas after nearly 2,000 people attended last April's event at the nearby Masonic Hall. Organiser Alan Cooper said the "increasing popularity and attendance has been truly heart-warming". The 9-11 April festival will feature the largest ever bar in Manx history. More than 150 beers, ciders and perries will be available from 30 hand pumps, Mr Cooper said. "We have all been blown away by the popularity. Last year there were queues at all of the evening sessions so we are expanding the venue to accommodate the interest." He continued: "The capacity for each session has grown each year from 250 to 400 and now 1,000 - so it has been rapid and reflects a genuine resurgence in interest in real ales. "People seem to relish the opportunity to try the unusual and the quirky." This year's festival will feature beers from every brewery on the Isle of Man and many selected from all over the British Isles and raise money for the Joey Dunlop Foundation. Festival goers will also be entertained by a number of local performers.